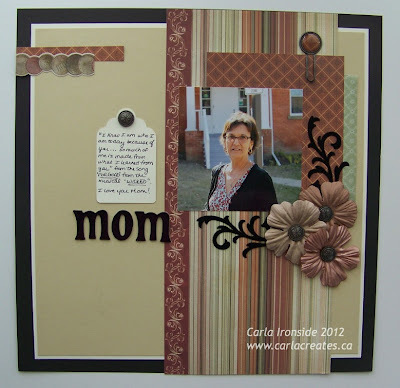 My layout today is all about my Mom!! Our new playlist song this week at Scrap it with a Song is the very beautiful "For Good" from the Broadway musical "Wicked". The song lyrics inspired my journalling on this layout. "I know I am who I am today because of you . . . so much of me is made from what I learned from you." My Mom is truly the best and she is my role model as far as what kind of mom I want to be to my kids & these song lyrics convey that perfectly. The sketch is from Once Upon a Sketch and their journalling theme this month was "Mum". Hope you'll join us this month at Scrap it with a Song - - we have some great songs on the playlist this month - you can play along with any of them before May 31st & link up to us -- we are looking for guest designers - so show us what you've got! Beautiful layout Carla! I love how you framed the page with the layers of cardstock. Thanks for the inspiration!